Divergences on how to deal with the nuclear issue of North Korea have been a decisive factor for President of the United States , Donald Trump , decide to replace Secretary of State Rex Tillerson , according to sources with knowledge of the decision. Tillerson was an early supporter of talks with North Korea, upsetting Trump, who wanted to keep pushing for maximum pressure on Pyongyang. This created fears that the secretary was too willing to make concessions to the regime, according to sources. In recent weeks Trump has been working on a succession plan, choosing CIA director Mike Pompeo to take over the State Department and CIA deputy director Gina Haspel to replace Pompeo in charge of the US intelligence agency's espionage agency. USA. A crucial goal was to assemble the team before moving on with North Korea. Trump and Kim pledged to meet at a time and place yet to be determined before the end of May to discuss North Korea's nuclear and ballistic missile programs. Tillerson was ignored by not being notified of Kim's invitation, and made his first trip to Africa when Trump met in the White House with a visiting delegation from South Korea last Thursday. The next day Trump asked White House chief of staff John Kelly to tell Tillerson he needed to resign, White House officials said. 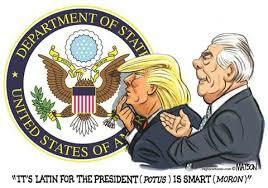 One source said that Kelly had been trying to protect Tillerson as much as she could, but that Trump had grown tired of his tendency to contradict him on a variety of issues and had been telling friends he was about to dismiss him. Tillerson, who was in Nairobi at the time and would still visit Chad and Nigeria, asked to return to the United States before the announcement of his resignation. On Tuesday, hours after his arrival in Washington, Trump announced on Twitter that the secretary was being fired and replaced by Pompeo.